In today’s article I would like to share with you my experience and reflections about possible causes for which we might work hard, but our bank accounts do not reflect it or we feel somehow “guilty” about taking money for helping people, or we might think it is unjust to take money for work we love, or we do with ease and fun. I remember times when I was working for the international publishing house and earned really good money. What was the reason? It was my boss who took care of my money :). But instead of the 100 hours that were agreed to in the contract, I worked 200. You know – last minute changes that ruined the whole plan so everything was to be corrected, many people had to be informed, etc. I earned good money, but still – it was the amount that was contracted for 100 hours. And, well, I was happy! Of course, one might think that this was because of the fact that I did not have my personal brand, that the market was difficult, etc; that I had to invest my time to build my fame. Yes, it is true that sometimes we do not have influence on some aspects of our income, and we have to build our “name”. But sometimes we do have the influence but we do not realize it. When I started to write my blog, I discovered that sometimes we are even eager to work for a different “currency” than money. I noticed that there are two sources of this situation. One is lack. The lack of something that is really crucial for us. Quite often this lack is quite “old” and might have its roots in times when we were children and somehow, we built an image inside of ourselves that tells us we are “not enough”. I discovered for myself that this source was a lack of acceptance, or even more – of self-acceptance. When I was working and getting a lot of admiration and acceptance, I completely forgot about money. And even though I earned some, I was not doing anything to get more. It took me some time to overcome this barrier, and one of the steps I took was therapy. The second – I dipped in Nonviolent Communication (NVC) to discover the world of needs and strategies. Now, when I know that my work is my strategy for sense and safety (financial safety as well), I react in a different way. I am thankful for the acceptance and admiration, and share how important it is to me (because it really is! ), but at the same time I remember to talk about money. It might sound like this: “I am very happy that you appreciate my work and you believe that I can do it, it fulfills my strong need for acknowledgement. At the same time I would like to take care of my financial safety and want to show you some facts. We agreed in the contract that I would spend 100 hours on it. It is done. To make these changes it will take another 20. May we look for a financial solution to it?”. What can be the worst thing that happens? Well, I can hear “no” and get some disappointment. It is not pleasant but, well, I can survive it. And it happens really rarely! The second source is completely different – I would say it has something to do with abundance. I am so full of something – love, compassion, hope or other values, etc. that I feel almost obliged to share it with the others that do not have it. I know that this value has changed so much in my life, that it has done so much good for me that I really cannot stop myself from passing it to people who need it. This is beautiful, and it makes the world better. And at the same time, when the balance is not with us, other needs become hungry: need of health (sometimes), need of safety (again). What can we do in such situations? I try to find strategies for all my needs, and I ask myself a question: how can I share my love for good communication, which is so needed now in the world, and take care of my safety and care in my business decisions? This way of thinking shifts my energy from the “pressure of sharing” to the strategy that is OK for the others as well as myself. How can I combine the value of helping and caring for myself with the next training course? I decide to make a paid course and at the same time offer 10% of my income to a fund that helps people in need. And in this way I am even more motivated to sell because I know it will serve not only me :). I also feel like selling in the name of these people I want to help. 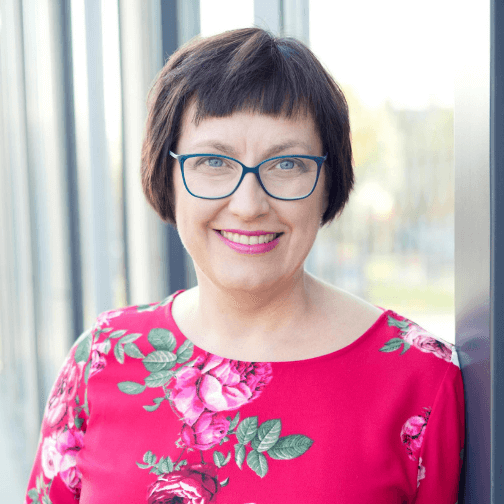 Ewa Tyralik-Kulpa – I am a trainer of emphatic communication with seven years of experience. I work at the School for Trainers of Communication Based on Empathy (Szkoła Trenerów Komunikacji Opartej na Empatii) and co-run a project called “Ripening Leaders” (Dojrzewalnia Liderek). I conduct trainings of emphatic communication and conflict management in organisations, and work with individuals. I am also a blogger and the co-author of an educational project about money entitled “I am rich” (JestemBogata.pl) in which I encourage sensitive/vulnerable people to invite money in their lives and match it with their values. I help people make money without guilt and shame, and efficiently take care of it. Before my life as a trainer, I worked in a multinational publishing house. As the Publishing Director I was responsible for the financial result for three titles, and I co-ran a PR-agency. I am the author of the book “What’s Eating Eva? How to understand each other”, and am currently working on a new one: “What About This Money? How to have an open heart and mind for money”. Is there any space for empathy in business?